It is Valentine's day today, I went to a nearby flower shop yesterday thinking of bringing some flowers for Chinese New Year. The owner told me roses are about 7 USD each! It is way too much! I quickly pick up my phone to call hubby and told him not to buy me any roses this year! Well, that does not mean that there will be no roses in the house this Valentines! 1. Clean, core and thinly slice apple. (I used a mandolin to slice the apple, which gives me uniform slices). 2. 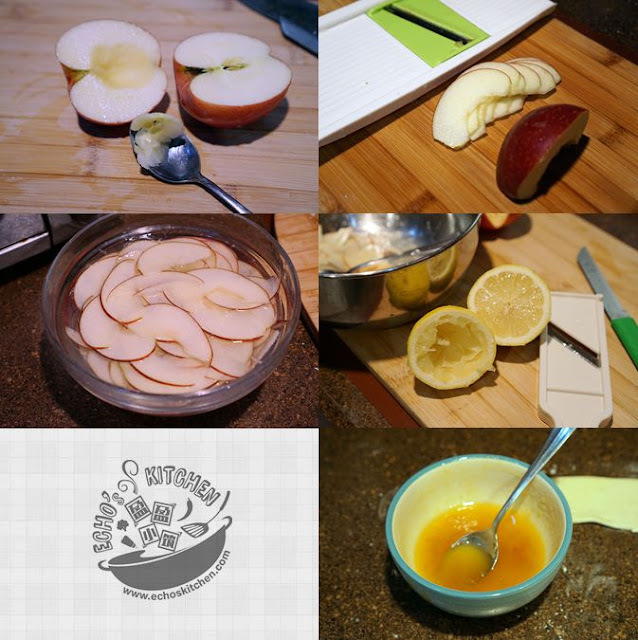 Place apple slices in a bowl and drizzle lemon juice over it, make sure all the slices are coated with lemon juice. 3. Microwave the apple slices on High for 45 seconds to softened the apple slices. Take the apple slices out and lightly pat dry with kitchen towel. 4. Mix 2 tsp of hot water with 2 tsp of apricot jam. 5. 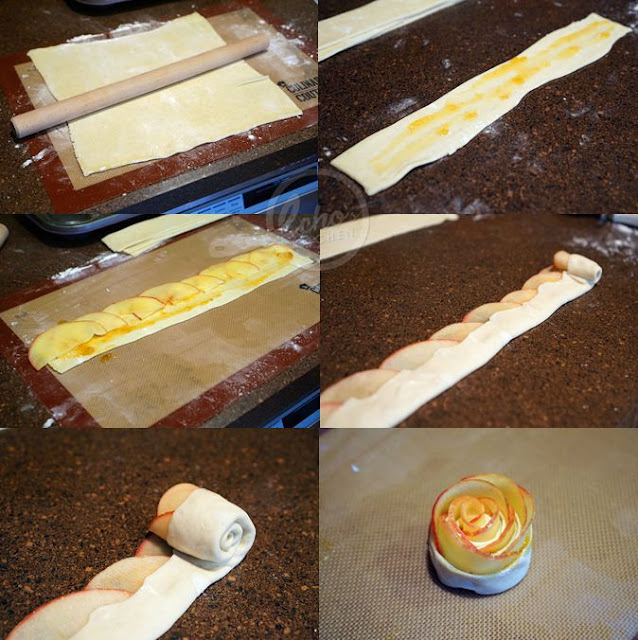 Roll puff pastry sheet out slightly to make it slightly thinner. With the help of a pizza cutter, cut the pastry into 6 equal strips, around 2 inches in width and about 10 inches in length. 6. Take one of the strip and spread apricot jam over it. 7. Place apple slices overlapping slices slightly along the long edge of the dough, try starting with smaller apple slices and gradually increase to larger slice. This will gives you smaller core and larger petals outside, which makes your "roses" looks real. 8. 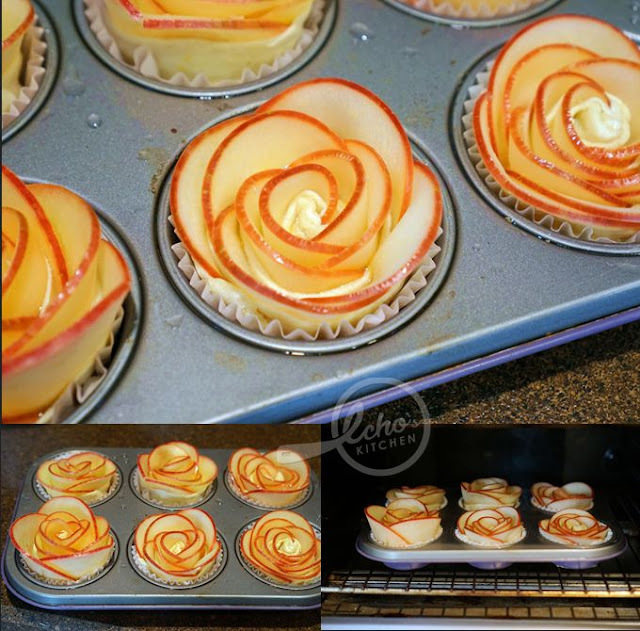 Fold bottom half of the dough over the apple slices, make sure that the dough should cover only half of the apple slices with rounded edges of apple slices exposed. 9. 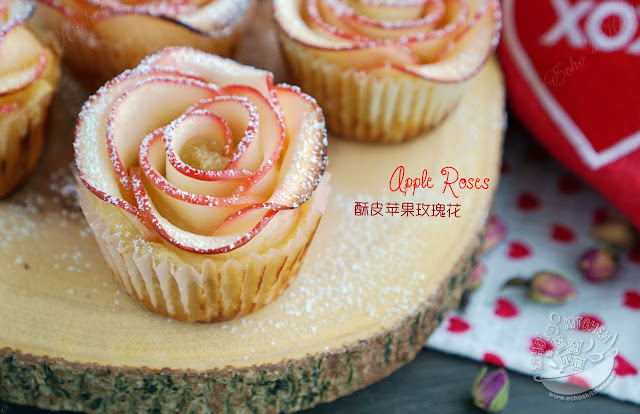 Starting from the smaller end, roll dough along the long side to form a rose-shaped pastry, do not roll too tight, just enough to hold all apple slices together will do. 10. 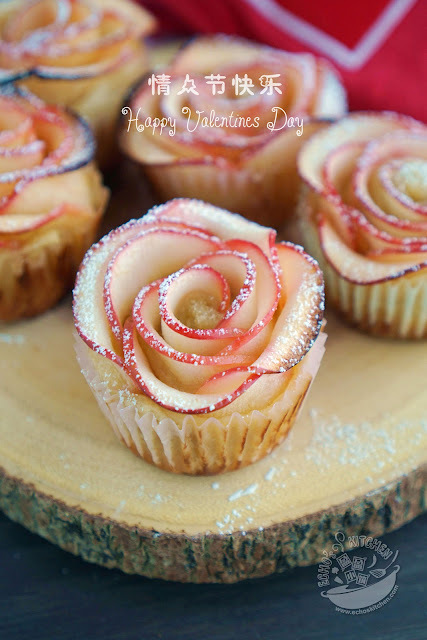 Transfer roses to muffin pan that lined with cupcake liners. Repeat steps to make 6 roses. 11. Preheat oven to 375 F (190 C)，place the pan at lower rack and bake for 25 minutes，lightly cover one sheet of foil paper over the "roses" after 25 minutes and continue baking for 15-18 minutes until browned. 12. 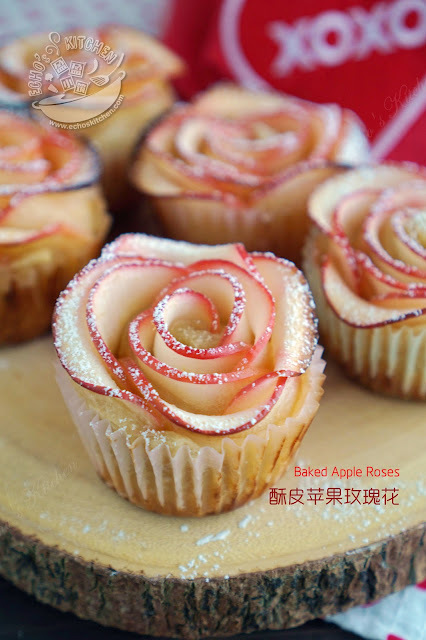 Remove the "roses" from oven and cool on cooling rack. sprinkle some powdered sugar before serving.